Skyworth will soon be launching its flagship OLED 4K TV in India, which is its thinnest OLED panel ever. Chinese TV and Audio-visual products maker, Skyworth, will soon be launching some new Smart TVs in India. The company has been around in India for a while now, and its products are reasonably priced. The company stated that it will be launching new TV sets in India, which will be thinnest in the market. These TVs would feature an OLED panel and the latest technology to make it stand out from the others. When it comes to budget LED television sets in India, there aren’t many brands that one can trust. But Skyworth sets have received good ratings and customers are very happy with its products. In recent times, Xiaomi had also unveiled its Mi TV sets in India, and they are a big competition for Skyworth. 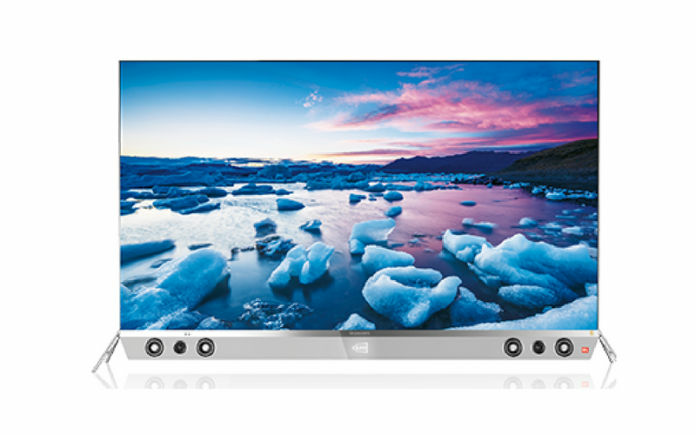 The Xiaomi Mi TV offers similar features and smartness at budget pricing. In China, the company is pretty big and holds a huge share in the 4K TV market. Now, it will be bringing some of its flagship products to India. One of their main products would be a 65-inch 4K capable TV, with a thickness of just 5mm. This would indeed be the thinnest TV available in the country. Skyworth’s Smart plus Android TV is said to revolutionise the Smart TV industry. From browsing the internet to gaming, Skyworth’s new Smart TV is bundled with the best of infotainment options available. One may stream live sports, watching TV shows or using Facebook and YouTube seamlessly owing to the integrated OS. The speculated release is said to provide a truly immersive audio experience through the JBL Sound Bar. The Skyworth OLED 65S9300 TV, would also have super thin bezels, 4K resolution 120Hz panel, a JBL Soundbar, a Smart OS built on Linux, and several other features. It would have a contrast ratio of 15000:1 and brightness of 500/150 cd/m2. As for the ports, the set will come with 3 HDMI ports, 1 HDMI ARC port, 2 USB, AV Input, Digital Audio Out, Component Video Input, Headphone port, and a LAN port. The JBL powered soundbar included in the TV is comprised of 5 speakers with 4W RMS and it supports DTS TrueSurround. This is just one of the products that Skyworth will launch in India. Other products will include the Air Series, the E200A Series, and the E4000 Series. Sizes will range from 65-inch at the top, to 32-inches, and not all of them would have smart functionalities or run Android. The press release doesn’t reveal the release date or the pricing of the new OLED 4K TVs and some other TV sets. However, the website for Skyworth does show some of the prices for other TV sets. Since the OLED TV is 4K and is top of the line, we expect it to cost upwards of Rs. 80,000. The press release did state that the pricing for the new products would be competitive against top brands. We assume the company is talking about Samsung, LG, Sony, and other big names in the industry. If the price for the OLED TV is anywhere less than a lakh, that would be amazing. Let us hope for the best, and wait for an official announcement from Skyworth. Would you be buying a Smart OLED 4K TV from Skyworth if the pricing is right? Or would you stick to other known brands in the country?